Functions: invisible writing UV ink, visible writing UV ink. 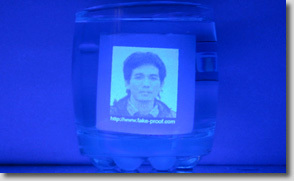 How to use: The invisible UV ink will turn red ( green, blue or yellow ) under the UV light. Colors: invisible change to blue fluorescent, invisible change to red fluorescent, invisible change to yellow fluorescent, invisible change to green fluorescent, invisible change to purple fluorescent, invisible change to orange fluorescent, invisible change to black fluorescence, red change to red fluorescence, yellow change to yellow fluorescence, blue change to blue fluorescence, Green change to green fluorescence, Orange change to orange fluorescence, Purple change to Purple fluorescence. Functions: invisible UV ink pen, visible UV ink pen. 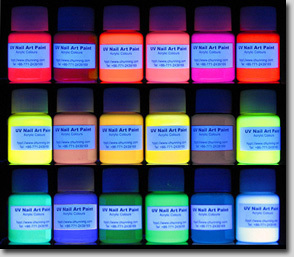 How to use: The UV ink will turn blue ( red, green or yellow ) under the UV light. Colors: invisible change to blue fluorescent, invisible change to red fluorescent, invisible change to yellow fluorescent, invisible change to green fluorescent, invisible change to purple fluorescent, invisible change to orange fluorescent, red color change to red fluorescence, yellow color change to yellow fluorescence, blue color change to blue fluorescence, green color change to green fluorescence, orange color change to orange fluorescence, black color change to red fluorescence, black color change to green fluorescence. 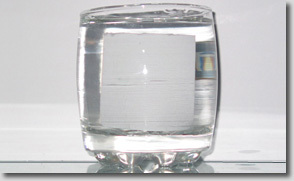 Functions: invisible UV inkjet printer ink, visible UV inkjet printer ink. How to use: The ink will turn red ( blue, yellow and green) under the UV light. This is the printed paper sample pictures which the printed paper is used our invisible UV ink through EPSON Inkjet Printer then it has been soaked in water for five days. Functions: invisible UV offset ink, visible UV offset ink. How to use:The Invisible ink will turn red ( blue, yellow and green) under the ultraviolet light of the detector. 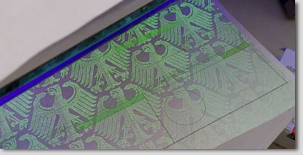 Functions: invisible UV stamp ink, visible UV stamp ink. 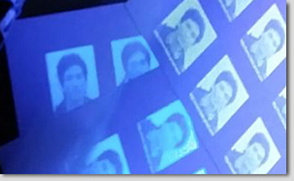 How to use: The Invisible ink will turn red ( blue, yellow and green) under the ultraviolet light of the detector. Colors: blue invisible stamp ink, green invisible stamp ink, red invisible stamp ink, purple invisible stamp ink, yellow invisible stamp ink, orange invisible stamp ink, red color change to red fluorescence. Functions: non fluorescent bond paper, contain watermark paper, red yellow and blue fluorescent fibres bond paper. 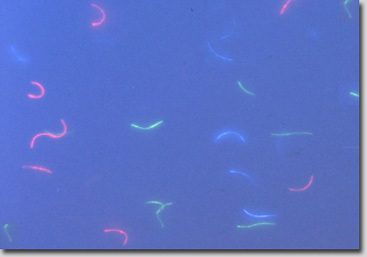 How to use: which would show very thin and light red, green and blue fluorescent fibres under UV light. Visible UV tattoo ink: Gorgeous bright fluorescent colors in normal light. All colors glow bright color in blacklight. Invisible UV tattoo ink: invisible colors in normal light, invisible colors glow bright Green ( yellow or Kelly) fluorescent in blacklight. 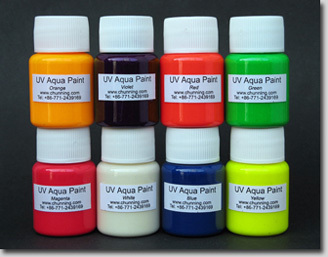 UV aqua paint: Gorgeous bright fluorescent colors in normal light. All colors glow bright color in blacklight. 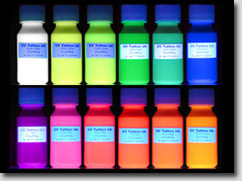 our uv pigments contains 8 colors a set, 1/2 ounce per color. the color glows bright and brilliant in the day-time, while it can glow glorious and radiant under the uv light. our water-based uv pigments can be applied to paint after being dilluted by adding water or other liquids. Our water-based pigments have superior adhesive capacity. Our pigments will help you to be artists! When you want to change your designs, please turn to our pigments. They will be your good assisstants. You just need to wash your painting by water and Re-design it freely. Our uv pigments are safe enough. It can be used on the skin and hairs of man with no harm. Each color of our uv pigments has its own special scent. Lily Scent for the white color; Lemon Scent, the yellow; Blue berry, the blue; Green tea, the green; Orange, the orange; Peach, the carmine; Rose, the red; Lavender, the purple. Though Delicate but Attractive. Each set of our pigments is accompanied by a color plate and a paint brush. Full set of All 18 UV Acrylic Paint. Gorgeous bright fluorescent colors in normal light. All colors glow bright color in blacklight. 1. You can write email to us in English or Chinese, and also please tell us your fax number. If you can't receive our reply by email, we can reply to you by fax. 2. If you want to place an order, please tell us your address and then we can calculate the freight charge for you. 3. We usually ship order by EMS of China post, it will arrive about 3-7 days, the waybill number could be checked after we ship the order.